(CBS News) Greenpeace is taking another jab at Apple's environmental record. This time, the California-based company gets a ratings upgrade - but is still not off the hook. The environmental group is going after the electric power companies Apple employs, asserting that the computer giant can help change energy policy. In April, Greenpeace released a report titled "How Clean is Your Cloud?" which scored companies including Apple, Amazon and Google. 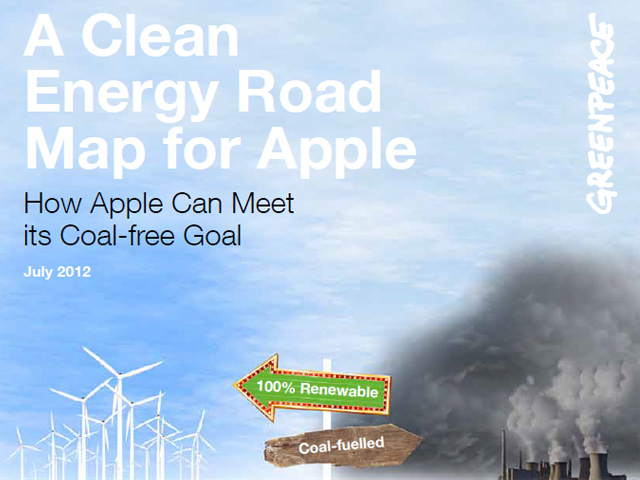 Greenpeace has updated the scorecard in a new report called "A Clean Energy Road Map for Apple." The group says it is rescoring Apple now because of its "recent ambitious and public commitments to clean energy." Greenpeace suggests that Apple should apply pressure to energy companies that will power its data centers - specifically planned facilities in Maiden, N.C., and Prineville, Ore.
Apple released plans for the Maiden data center in February's 2012 facilities report. Utilities for the region are provided by Duke Energy, which is the largest electrical power holding company in the United States. Greenpeace would like to see Apple apply pressure to Duke to "eliminate its mountaintop coal removal operations from Apple's electricity supply chain." In its defense, Duke says that it is actively seeking alternative methods of energy. "We're the only company in the country that actively seeks non-mountaintop coal removal," a Duke Energy spokesperson told CBS News. "We feel like we've moved the needle by asking our suppliers to deliver non-mountaintop coal removal bids. It's an integral first step." Realistically, can Apple change energy policy? "I think it might surprise people how much power Apple does have over those utilities," David Pomerantz, a spokesperson for Greenpeace International, told CBS News. "Apple is their dream customer. They have a roomful of electricity-guzzling machines that never turns off." Pomerantz suggests that Apple has the power to change policy at energy companies like Duke - and perhaps even across the U.S. - by making demands such as the elimination of mountaintop coal mining. According to Duke, it's not all up to the utility company. Regulation varies from state-to-state. "In North Carolina, we are allowed to buy non-mountaintop coal as long as the cost is not higher than conventional coal supply. Even if we wanted to pay more, we couldn't because the state mandates it," a Duke spokesperson said. "What organizations like Greenpeace need to realize is that the opportunity to prompt meaningful change in energy policy lies at the state regulatory level." Duke's sustainability report can be found on its website. "We're committed to building the world's most environmentally responsible data centers and are leading the industry in the use of renewable energy, including the nation's largest private solar arrays and non-utility fuel cell installation. As we've said before, our North Carolina and California data centers will be coal-free as of February 2013 and our newest data centers in Oregon and Nevada will be designed to meet that standard from Day One." What does this mean for cloud computing? "Greenpeace is a big supporter of cloud computing and the Internet," Pomerantz said. "We see the Internet as the engine that could drive the whole economy toward clean energy. If we can get a company like Apple to put the pressure to move toward clean computing. They could put pressure on Duke." Pomerantz believes private companies like Apple, Google and Amazon can accelerate the move towards clean energy in the United States. As cloud computing grows, questions of energy source will surely be part of the evolving conversation. While Greenpeace's report suggests some of these companies are using so-called "dirty" energy, overall cloud computing can be relatively energy efficient. A 2010 report released by Nucleus Research evaluated cloud computing at Salesforce.com. The results suggested that "its customers saved the energy equivalent of 11 barrels of oil every hour." "Cloud computing uses 91 percent less than traditional on-premise applications," Rebecca Wettemann, vice president of research at Nucleus Research, told Tech Talk. How much power does Apple have? Apple can't directly change energy policy, but is positioned to play a leading role in influencing the industry. Greenpeace does give Apple credit for its progress. However, the group believes more work must be done as cloud computing grows. This isn't the first time activists have applied pressure for Apple to lead the tech industry to implement better labor and environmental practices. Pressure to improve working conditions at Foxconn, the factories that make iPads and iPhones, may have caused the company to open its supply chain to consumer advocacy groups for the first time. Apple entered a partnership with the Fair Labor Association in January - the first technology company to join the association as a participating company. In doing so, the company agreed to uphold the FLA's workplace code of conduct throughout their entire supply chain. As a result of that partnership, Foxconn has pledged to make improvements companywide - in effect, making factories that work on Microsoft, Dell and Amazon products more compliant with labor laws. Apple publishes environment and supplier responsibility reports on its website.According to the computer giant, 60 percent of the energy of its Maiden data center will be produced onsite, with the remaining 40 percent purchased in the region. "We haven't had a lot back and forth with Apple," Pomerantz said. "Our door is totally open. We'd love to have an open relationship with Apple. We want them to get the coal out of their iCloud."